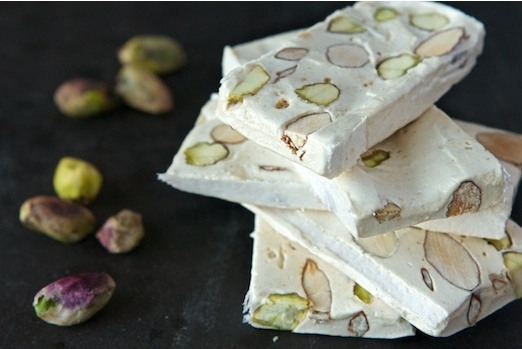 This Nougat is available on Petit Amuse. Nougat is produced by whipping egg whites and honey in copper pans over high heat. While still pliable and hot, nuts are folded in and the mixture is spread out in wooden molds lined with wafer paper, where it cools until it can be cut and wrapped. If your vision of nougat is tough, tooth-breaking bricks, you’re in for a pleasant surprise. Murat’s nougat is incredibly supple. Aromatic honey lends a gentle sweetness, while fresh, flavorful pistachios and almonds offer textural contrast. Oh My Goodness, this is GOOD! There was a time (like before I tasted this nougat bar) that I would have said I’m not a big fan of nougat. I thought it to be hard and sickeningly sweet. But, that’s all changed now that I’ve tried this nougat. This is amazingly good. The nougat is soft and chewy with a lightness to it that reminds me more of marshmallow than what I thought of when I thought “nougat.” It’s almost… fluffy. Yes, it is sweet, but this isn’t cloying the way the nougat I’ve had in the past is. I’m sure that if I were to eat more than 1 bar of this at one sitting, it would get too sweet, but, as it is, the bar is quite satisfying: sweet but not too much and loaded with pistachios and almonds. The nuts give it a nice crunchy texture and mellows out the sweetness a bit. The only problem I’ve found with this? It disappeared too quickly, and unfortunately, I find them to be a bit pricy. $5.94 per bar on Foodzie? Yikes! I don’t think I will be re-ordering these any time soon. This is AWESOME and I want more. I wish they weren’t so expensive. My tea recommendation? Well, I chose something malty: this Assam Kama from Simpson & Vail. It has just the right touch of savory quality to offer contrast to the sweetness of the nougat, making this a very enjoyable, palate-pleasing snack. Black Mission figs bathed in a sweet syrup of red wine, cane sugar, balsamic vinegar, rosemary and sea salt; try paring with grilled steak and rosemary roasted potatoes. Also delicious with fresh goat cheeses, bleu d’auvergne, panna cotta, or old fashioned vanilla ice cream. Serve alongside a blue cheese tarte and fresh salad greens. Click on this link to learn more about these Pickled Figs and other products from Boat Street Pickles. Oh … my … goodness! This is GOOD! Despite my disappointment with the changes that have been made with Foodzie (a new format and a new way they handle their foodzie tasting boxes, not to mention a new, higher price), I must admit that they sure can pick ’em when it comes to selecting some amazing items for the tasting boxes. This might just be one of my favorite items that I’ve tried from a tasting box yet. And while these Pickled Figs form Boat Street Pickles do not quite match that memory for me due to the balsamic vinegar and other flavorings added to make these “pickles,” they are still incredibly yummy. The figs taste as though they were picked and processed at the peak of freshness. They taste plump and juicy, and just a wee bit fermented. I love that I can feel the seedy texture of the fig, it does remind me of the texture of those tree-ripened figs from my childhood. The balsamic vinegar adds a tangy flavor to the pickle while at the same time, it highlights some of the sweetness of the fig. It’s a very nice contrast of flavor. I can taste the slightly resinous note from the rosemary. All of these distinctive flavors come together to create a sweet and tangy relish that is absolutely memorable. I wasn’t sure how I was going to serve these … but this evening, I made a very simple baked chicken breast dinner for the family, and I decided that this would be the time that I opened the jar and gave it a try. I scooped out a generous dollop of the Pickled Figs and served it with my chicken, and it managed to elevate what might otherwise be a slightly boring chicken breast to something quite extraordinary! I don’t know how I’ll be able to eat baked chicken breast without this on the side now! Tea recommendation: actually, I didn’t serve any specific tea with this relish, since I enjoyed it with my supper. I had a glass of Green Pomegranate iced tea (Which I brewed using this tea from Persimmon Tree Tea) – and while I can’t say that the two perfectly complimented each other since I was so busy marveling over how well it complimented the chicken – the tea worked well with dinner overall. This would also make a nice substitution for cranberry sauce at the holiday meal. Yes, yes, I know, that day has come and gone, but, the winter holiday – whichever you might observe – is still on its way, and this would be just perfect alongside that rib roast (if you’re serving one), or if you’re baking another turkey – get some of this. It would even be spectacular with ham. That is … if you don’t eat it right out of the jar before the guests arrive! I LOVE this stuff. Now, I just need to locate it. The website does not indicate any shops in Vancouver that offer any of Boat Street Pickles products, but there are a couple of places in Portland. Maybe I could persuade Chuck’s Produce here in Vancouver to start carrying it. It is certainly worth the effort. 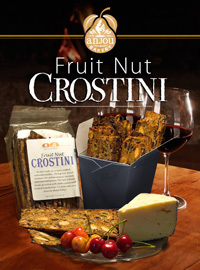 To learn more about these Crostini “crackers,” visit Anjou Bakery’s website. I was thrilled to find these amongst the many goodies in this month’s tasting box from Foodzie. I hadn’t yet tried this particular dried bread cracker, but, I had tried something similar: Raincoast Crisps, and I was quite a fan of those crunchy treats. I was quite sure I’d end up enjoying these just as much as I enjoy the Raincoast Crisps (my favorite flavor is the Cranberry Hazelnut). And I enjoyed these almost as much as I do the Raincoast Crisps. These are a little different in taste: I can taste the rustic bread, I can taste (and feel the texture of) the different grains in the bread itself. I really like that. I can really taste the nutty flavor of the whole wheat in the bread. The raisins add a nice sweetness to the crisp, as well as a pleasant chewy texture to contrast with the very crunchy texture of the bread. And of course, let’s not forget about the nuts. The ingredients list both almonds and pecans, but what I taste most are the almonds. I can taste hints of the pecans, it isn’t a very distinct flavor at all. I enjoyed these on their own, mostly because I didn’t have a good cheese to enjoy with them, and I really wanted to try them NOW and not wait until I had some cheese to go with it. But I am sure some cheese would make a delicious accompaniment to this crostini. My tea recommendation? I selected a pleasant, mild green tea to enjoy with these crackers: Hysson from Gorreana Tea. The sweetness brought out some of the nutty flavors in the crisps. A really delicious tea-time combination. While I prefer the Raincoast Crisps, I enjoyed these quite a lot too. They are very crispy and also quite hearty. Would I buy them again? Perhaps, if I saw them in the store, but I don’t think I’d go out of my way to order them. I am really glad that they were included in the tasting box, though! If ever there was a foodie holiday, this is it. Most people in the United States right now are busily preparing their feasts. But not me. Whats this, you say? I claim to be a foodie and I’m not cooking a Thanksgiving feast? Nope. Not today anyway. My husband works today, and for the last ten years has worked every Thanksgiving (save one or two, I think). The line of work that he is in requires him to be there on this day, as it is one of the busiest days of the year for the company. So, we generally postpone the holiday until it’s convenient for everyone in our household. Which is just fine with me. To me, Thanksgiving is more about gathering with those you love: family. It doesn’t really matter which day you choose to serve the turkey and all the trimmings, does it? But this IS a foodie blog and Thanksgiving is a foodie holiday, so I thought it would be appropriate if I share with you one of my favorite holiday recipes. In my opinion, it’s the one overlooked dish on the plate: the cranberry sauce. While growing up, the cranberry sauce was so overlooked that we were served that jelly stuff out of the can, sliced haphazardly using the markings from the can to cut the slices, which were still imparted on the can shaped, jiggling ruby-red jelly. I’m sorry, that stuff is alright if you’re a kid, but, one of the first things that I changed about my own Thanksgiving when I became an adult is the cranberry sauce, because… gross. Just… gross. Now, I am not one to go and get a bag of fresh cranberries and cook them down. I wish I were, but, on Thanksgiving, there’s a lot of stuff to do, and that much work is not something I want to pile onto the list. So I do utilize the can, but I use the canned whole cranberries instead of that jelly stuff. Start by steeping the chai tea strong. If you generally use 1 1/2 teaspoons of loose leaf chai to make a cup of chai, use 3 teaspoons. Steep 1 cup of the chai using boiling water and steep for 3 – 4 minutes. Add a handful of dried cranberries to a bowl and strain the chai over the cranberries. Set the bowl aside. 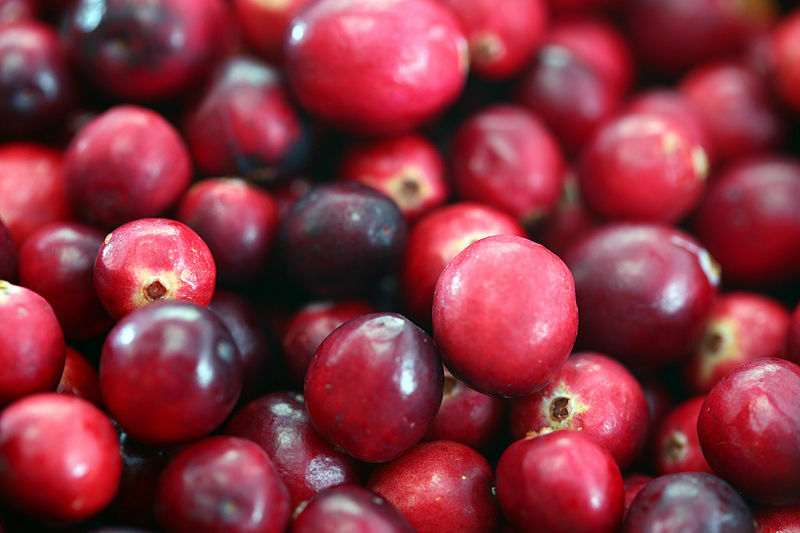 Open the can of cranberries and put in a small saucepan over medium to medium-high heat until it comes to a simmer. In the meantime, slice the pears into small chunks (I generally use the equivalent of 1 1/2 pears in this compote. You can use more or less according to your own preference), and zest the orange. Once the cranberries are brought to a simmer, add the chunks of pear and about 3/4 teaspoon of orange zest. I don’t measure the orange zest. I just eyeball it, and this is an estimate of how much I add. Then cut the orange in half and squeeze the juice and pulp (no seeds, please!) into the sauce. Stir. Now add the dried cranberries which have reconstituted slightly in the chai. Pour off the excess chai (don’t discard it though), and add the cranberries. By this time, it’s probably getting a little thick and could use a little liquid. Add the remaining chai by tablespoons until it is a little liquid-y (as it will continue to reduce down a bit), but not too much. I generally find about 3 tablespoons is about right. Just remember that you can always add a little bit more, but you can’t take it away once its in there, so add it slowly until you reach the ideal amount of liquid. Allow to continue to simmer and reduce down a bit. Once you reach a pleasing consistency, remove from the heat and grate some fresh nutmeg over the top and stir it in. Then I put it in the fridge to cool because my family prefers it served as a chilled salad, but, it is also quite nice served warm. This is my absolute favorite way to serve cranberries, and while cranberries aren’t as popular with the rest of my family as they are with me, my family actually eats them when prepared this way (they don’t like the cranberry sauce as is). It also tastes great on leftover turkey sandwiches the next day. Roasted Garlic Onion in-shell pistachios are our most popular flavor. Coated with the perfect blend of garlic with a dash of onion; a bold taste to tantalize your taste buds and feed your hunger cravings. In a 1-lb resealable package, they’re the perfect snack. Fiddyment Farms’ flavorings are all natural and do not contain any artificial flavors or preservatives, and you can rest assured that our pistachios are Naturally Opened on the tree, never opened by artificial means, nor have they been bleached. We roast the pistachios in small batches at our own facility. Well, I don’t think I’ve ever eaten pistachio nuts that tasted so good that I found myself sucking on the shells. Yes, as weird as that sounds, that’s what I am doing with these Garlic Onion Pistachios from Fiddyment Farms. I’m not sure how sanitary it is (and if you know, please do not tell me), but what I do know is that because these were flavored in their shells, that the shells have a good amount of garlic onion flavoring on them, and I’m loving that garlic onion flavoring. But, as delicious as they are, there are a couple of things I wanted to make note of. First of all, they are a bit messy. Of course, the eating of shelled pistachios is always a little messy because of the shells. But, these tend to be even messier than a standard, lightly salted pistachio that you might find in the grocery store, especially if you’ve taken to sucking on the shells like I have. The seasoning is a bit sticky, and it causes the nuts to stick in the shells and therefore do not easily pop out. This is not a particular problem if you’re sucking on the shells, because they ease their way out of the shell at some point. But, if you’re looking for a mess-free snack to serve for friendly gatherings, this might not be the ideal choice. And if you’re one who enjoys your snacks at the computer, you may want to have a napkin handy. These are very yummy, guaranteed to make the garlic-lover’s taste buds happy. Especially delicious with a Yunnan tea, I highly recommend this Yunnan Golden Buds from Verdant Tea. The spice on the pistachios brings out some of the mellow spice in the tea, while the honey-esque tones of the tea provide pleasing contrast to the strong flavors of the nuts. 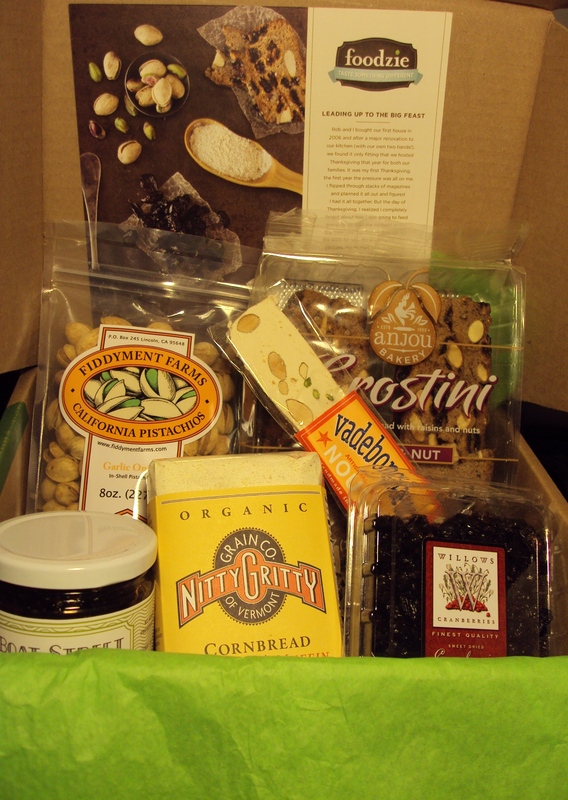 November’s Tasting Box is here … and My! How it has Grown! Actually, the box arrived on Saturday (November 19th), but, I held off on finishing this article about it because Monday (November 21st) Foodzie promised an email to their subscribers to better explain the changes to the tasting box program, and I wanted to wait until then to complete this article so that I could include information about those changes. You see, this box is different. Much different. First of all, it is larger. (The measurement of the box is approximately 10″ x 8 1/2″ x 5 1/2″, versus the previous box size of approximately 11″ x 7″ x 2″) It is larger to accommodate larger sized food products (everything in this month’s box appears to be full-size rather than a sampler size). And with this different size came notification of other changes on the horizon. The monthly subscription rate is now $29.99 instead of the $19.99. And for this 50% rate increase, we get the larger size box and portions, plus, we get more choices concerning the contents of the box. But the box isn’t the only thing that’s different. Foodzie has implemented changes too. But before I delve deeper into the changes with the box, let me share with you a little about what this month’s box included. The theme of this month’s box is “Leading Up To The Big Feast.” I assume that the “big feast” refers to Thanksgiving (and this box arrived just barely in time for preparation of that big feast). Inside the box, there are Garlic Onion Pistachios from Fiddyment Farms, Heirloom Cornmeal Baking Mix from the Nitty Gritty Grain Company of Vermont, Dried Cranberries from Willow’s Cranberries, Pickled Figs from Boat Street Pickles, Fruit Nut Crostini from Anjou Bakery, and Pistachio & Almond Nougat from Vadeboncoeur Nougat. Lots of yummy foods here just waiting for me to dig in … can’t wait! As happy as I am with the box, I must confess my disappointment with the changes at Foodzie. First of all, I liked the size of the smaller box better. I also liked the smaller price. I don’t think that I will be continuing the subscription… and this makes me sad, really. Because I have really enjoyed the tasting boxes up until now. Second, I find the whole format of Foodzie confusing. It appears to no longer be a marketplace where consumers can go and shop and buy foods that are not readily available elsewhere. I liked that aspect about Foodzie. But now it appears they’re focused on these collections and if we are able to shop the way we were before, it certainly doesn’t appear that way by the website. I understand that change is necessary but I really dislike the changes that have been made with Foodzie – I’m very disappointed. I discovered the Pit Stop in Beaverton through Living Social, and to be honest, I don’t think I would have ever visited this establishment had it not been for Living Social. It’s just not really my kind of place. In a sports bar like this, I was a fish out of water. What lead me to purchase the Living Social coupon was I thought it was a place my husband could appreciate because he does love sports. Unfortunately, we chose to visit on a Sunday, and I was surrounded by football fanatics. More than the food of this place, what surprised me the most about our time at the Pit Stop was the fact that there are people who are even more excitable than my husband while watching a football game (or in the case of the Pit Stop, all the football games at once). Order: For an appetizer, we shared an order of Pulled Pork Sliders and Fries ($8.99 for five sliders). 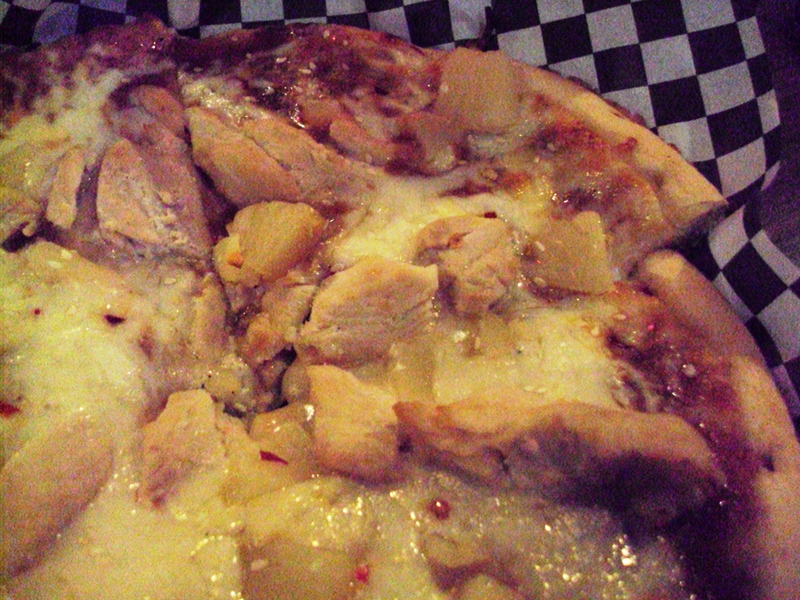 I chose the Thai Chicken Pizza ($9.99 for a 9″ pie). We had ordered the sliders without the cole slaw topping, and I guess this was overlooked on the ticket, because our first order of sliders arrived at the table covered in cole slaw. We sent this order back (my husband does NOT like cole slaw). A replacement (without the slaw) arrived pretty quickly, and I really did enjoy these sliders. The pork was incredibly tender, and they were not slathered with any type of sauce. Instead, they brought out two different sauces (one mild, one spicy) so that we could top the sliders ourselves. Since pulled pork is often over-sauced, I liked that I could control the amount and the heat of my sauce (I found that a ratio of 2 parts mild sauce to 1 part spicy sauce was just about perfect). The french fries were REALLY good. They were coated in a batter before frying – somewhat reminiscent of a curly fry type batter. Normally, I don’t really like the curly fry batter, it is often overly seasoned and takes away from the flavor of the potato. But this batter was spot-on … it enhanced the crispiness of the french fry without overwhelming it. Before we arrived at the Pit Stop, I did glance at the online menu, and I figured I’d probably order from their barbeque selections. However, when we got there, my eye kept going back to the Thai Chicken Pizza. And I’m glad I decided to order this pizza. Yes, I am sure I would have loved the ribs, but, I really liked this pizza. The dough itself was just kind of average. Nothing really outstanding… in fact, it reminded me a bit of biscuit dough but didn’t rise like a biscuit would have. But the toppings made it for me. The peanut sauce was yummy, and together with the pineapple chunks it provided sweetness to the pie to contrast the spiciness of the pepper flakes. The chicken was tender although it was a little on the dry side (since it was probably twice cooked: once prior to baking the pizza, and then in the oven with the pizza). But I was able to overlook this because it had a pleasing tender texture, and the flavor of the peanut sauce was so appealing. The sesame seeds added a nice crunchy and slightly nutty element to the pie. As delicious as it was, I couldn’t finish the pizza in one sitting, but I was able to bring the rest home and the left overs were almost as good as the fresh baked pie. While I probably won’t ever be back to the Pit Stop, I certainly did enjoy my visit. Unfortunately, hanging out in a bar full of screaming sports fans and wannabe sports announcers just isn’t something that’s high on my list of things I want to do. That being said, if you are a sports fan living in the Portland/Beaverton area, you should definitely stop by the Pit Stop. I was pleased at how delicious the food was. The service we received was also very good – our server was very busy so there was some wait time, but, this was more than made up for with personable service.